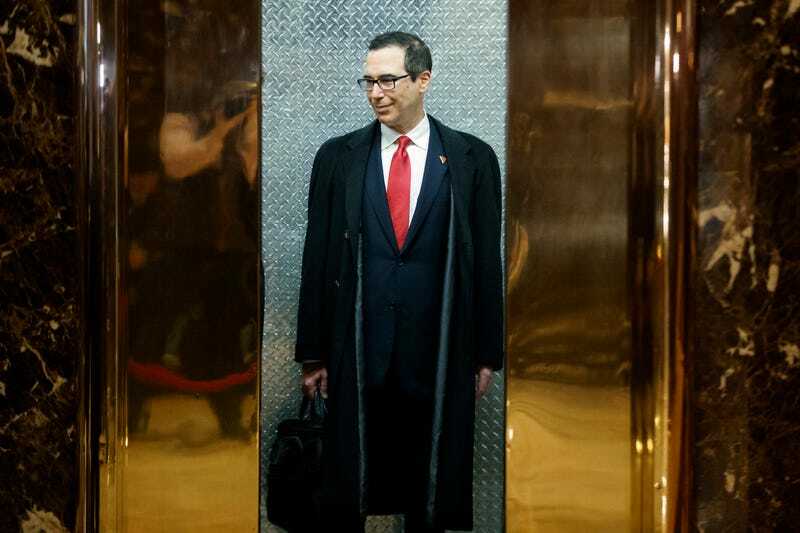 A former Goldman Sachs banker (whose father was also a Goldman Sachs banker), Hollywood movie producer, and hedge fund manager has been appointed head of the Treasury Department. Donald Trump dined at Jean-Georges with a former private equity titan who is being considered for Secretary of State. He has also met with the president of Goldman Sachs and the head of the world’s largest hedge fund. A billionaire distressed-debt investor has been selected to head the Commerce Department. He joins a fellow billionaire—an Amway heiress and major political donor—who will be running the Department of Education. The new transportation secretary is the wife of the Senate majority leader. She was also George W. Bush’s labor secretary, and was so popular with her coworkers that they held a “good riddance” party when she left. Access to Donald Trump, Mike Pence, their family members, and their cabinet secretaries can be purchased off a menu ($25k-$1 million) by wealthy donors to the Presidential Inaugural Committee. The dastardly elites will surely have much to fear from this band of outsiders.